Customizable Control Each remote outlet comes ready for use, but can be reprogrammed to meet your needs. The learning code for the ZAP outlet allows you to pair up to 10 outlets for a single button on the remote. You’ll also be able to program multiple remotes to one outlet for full control wherever you go around the house. Impeccable Quality Composed with IPX4 and UV-coated materials, this outlet is ready for any type of weather. It can even be controlled up to 150 feet away, through walls, doors, and furniture, without interfering with other electronics in your home. 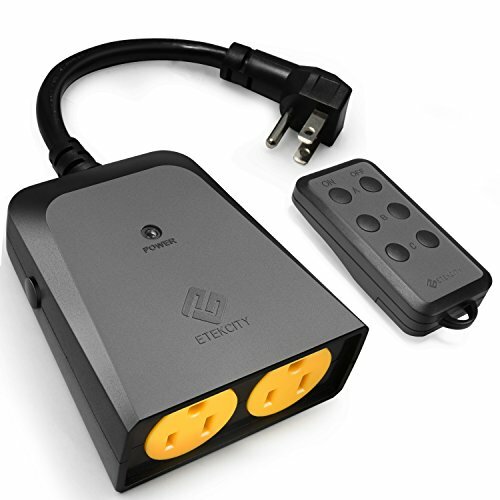 Versatile Use The outlet can also be used indoors to power everyday appliances such as lamps, heater, and fans. You’ll find a variety of ways you can upgrade your devices at home. Specifications: Material: ABS 94V0 (a fireproof material which can resist 750 degrees centigrade high temperature) Plug Type: 3-Prong US standard Size: 3.95x 3.35x 1.5 inches AC Voltage: AC 120V (50/60MHz) Maximum Current: 10A Maximum power: 1200W Stand-by comsumption: 0.07W Max Water resistant level: IP44 Safety Protection: UV protection, recoverable surge protection and overload protection.